Stephen was one of the great men of faith in the early church. Though he was not an apostle, he holds a special place in scripture because he was chosen to minister to the widows who were being cared for in Jerusalem. It seems that some of the widows were being overlooked and neglected, so Stephen and six other men who were "full of faith and the Holy Spirit", were chosen to take care of them. He also was the first Christian martyr (MAR ter). A martyr is a person who holds to a belief so strongly that he/she is willing to die for it. Such was the faith that Stephen had in Jesus Christ. Stephen was able to work miracles among the people. He began to preach and some of the Jews would argue with him about his beliefs. These evil men persuaded some men to say that Stephen was speaking against Moses and even against God. This wasn't true, but many people got upset about it because they believed it was true. They took hold of Stephen and brought him before the Sanhedrin, the Jewish rulers. In the picture you can see him appearing before the group. Directly in front of him is the high priest with the beautiful breastplate on the front of his garment. It contained gold and twelve different precious gems. On each stone was written the name of one of the tribes of Israel. These were powerful men who were able to make life and death decisions about people. But Stephen was not afraid to speak the truth. As he stood before them, they saw that his face was like the face of an angel. He began to speak to them. He told about the whole history of the Jewish people beginning with Abraham. Then he accused the men, and their fathers before them, of hurting and killing the prophets, and even of killing the Righteous One, Jesus. The rulers became very angry with him, but Stephen looking up to heaven, saw the glory of God, and he saw Jesus standing at the right hand of God. He told the men what he was seeing. They put their hands over their ears because they didn't want to listen to him. They yelled at the top of their voices. They rushed at him, dragged him out of the city and began to stone him to death. While they were throwing stones at him, Stephen prayed, "Lord Jesus receive my spirit," and "Lord do not hold this sin against them." Then he "fell asleep" (died). He had the same forgiving spirit that Jesus had when he had said the same words when he was on the cross. The young man who was consenting to Stephen's death was Saul of Tarsus. Stephen was brave, and he was not afraid to speak the truth. Suppose you and your friend are in a store, and you see her take something from a display and hide it under her coat. What do you do? Do you also take something to see if you can get away with it? Do you just say nothing? Or do you say to your friend, "You need to put that back. Stealing is not right, and you will be in big trouble when they catch you."? You may lose your friend, but you will be doing her a favor if you can stop her bad behavior. Stephen, by telling the truth, was willing to give up his life in order to please God. 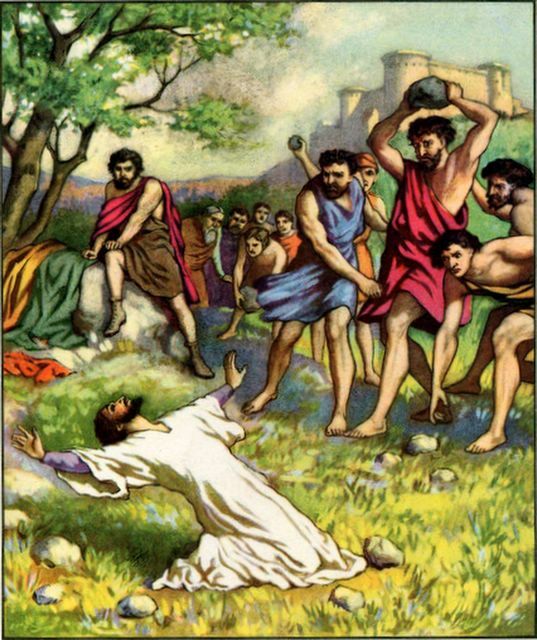 English Bible Activities Select story #250 in the list for activities to accompany this Bible story. Spanish Bible Activities Select story #250 in the list for activities to accompany this Bible story. I am that Stephen and my story is as compelling as that, in fact it's a miracle , a miricle which could change the way in which we live. Wake up to Heaven my friends, we stand in the Garden, on a starship named Eden! Thank you for helping me to understand the life & times of deacon Stephen . Thank you for sharing the Word of God with audio and visuals for children! I am impressed and thankful to the Lord because of the work that you have put together. This is an amazing resource for me I teach the Word to the children and I also happen to love the ARCH books that you advertise. Thank you so much for making this free and available to all who want to hear. Great is the Lord Almighty's Name! This page displayed 270,795 times.